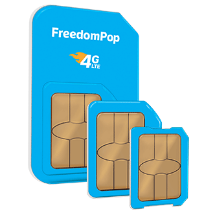 This article was published by ComputorEdge , issue #2809, 2010-02-26 , as a feature article, in both their PDF edition (on pages 7-12) and their website. Online auction sites (such as eBay, the undisputed leader in that field) and classified advertisers (such as local newspapers) may seem very much at odds with one another, because the former group has been inexorably pulling business away from the latter group — to the extent that a number of newspapers are now going out of business or have already closed their doors, blaming the decline in advertising revenues as a major cause. Yet these competing groups do share a critical component of their respective business models: each one is predicated on the idea of charging people who wish to connect with one another, primarily for the buying and selling of goods and, to a lesser degree, services. These auction and advertising organizations may compete with one another on price, but what chance do they have against an online marketplace that, for the most part, charges nothing? 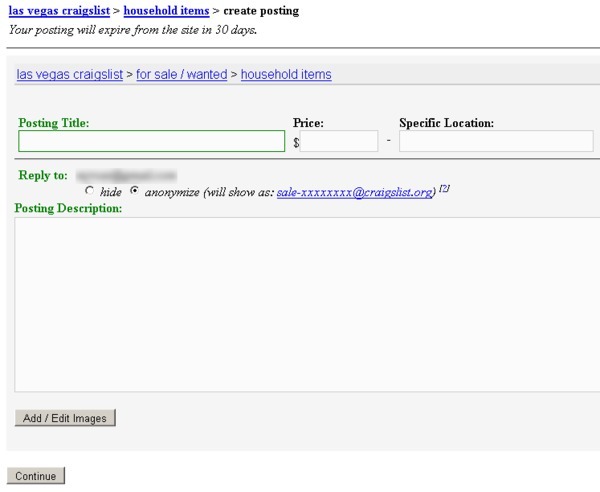 Craigslist is arguably the most popular way for people to buy and sell items, find roommates, search for jobs, etc. — almost all for free. According to its Wikipedia entry, Craigslist caters to users located in roughly 700 cities, in 70 countries. But to the major auction sites and classified advertisers, the global reach of Craigslist is the least of their worries. What likely keeps the head honchos of those companies awake at night is a combination of several factors: Craigslist is the 11th most popular website in the United States, is the number one job board in the country (hosting more than one million new job listings each month), is growing at a phenomenal rate, and is the leading classified ad platform in the world (hosting more than 80 million new ads each month) — surely the stuff of executive nightmares. It is understandable that these management types, and the companies they run, did not anticipate that Craigslist would catch up with and surpass them so decidedly, in view of the Craigslist's humble origins. It started in 1995 as a simple mailing list limited to the San Francisco Bay area, founded by Craig Newmark, who apparently is the polar opposite of the stereotypically arrogant and profit-centric Web business leaders found in the technology hotbeds of California. Despite building his personal mailing list into a successful business that enjoys over $100 million in annual revenue, Mr. Newmark holds true to his original vision of helping people, rather than maximizing profit — much to the exasperation of stakeholders and industry pundits. Anyone interested in learning more about Craigslist as an organization, and its history, should consult the aforementioned Wikipedia entry, which provides the reader with a fair and detailed overview of a phenomenon that has seen its share of drama — including tussles with one of its major shareholders, eBay (of all possibilities!). Craigslist has much to offer to both buyers and sellers. It costs nothing to sign up for an account, nor to browse the countless listings for one's city of residence (or at least the nearest major city, for those people living in rural areas or small towns). Craigslist only charges for posting jobs in ten US cities, and for broker apartment ads in New York City. Aside from that, you are free to post just about any kind of advertisement provided that it does not involve something illegal or too objectionable (even "adult services" are allowed… or so I've been told). To get started, head over to the Craigslist website. If you have never visited that site before and thus have not yet designated a city, then you should see the Craigslist generic home page. The right-hand sidebar is organized into three columns, containing several sections: other cities, US cities, Canada, US states, and countries. For US citizens, the cities that comprise that first section are typically those closest to one's current location — undoubtedly based on your computer's IP address, which can be used to detect your current city and even neighborhood. The second section includes all the major metropolitan areas in the United States. Once you have clicked on the link of a particular city, Craigslist will remember that one, unless you later visit the main page for another city, or unless you have cookies disabled in your Web browser. For instance, if you are a resident of the greater San Diego area, your main page should look like the screenshot below. To create your own account, click on the "my account" link in the upper portion of the left-hand sidebar. 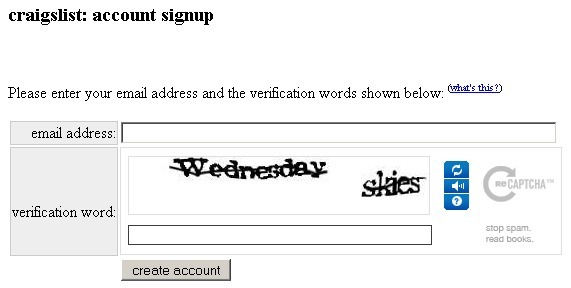 Then choose "Click here to sign up." Opening a Craigslist account requires nothing more than a valid email address — and there's no need to use a disposable address to avoid spam, because Craigslist does not spam its users. At the account sign-up page, simply type in your email address as well as the verification words (i.e., CAPTCHA) displayed on your screen, and then follow the directions from there. Posting your own ads is almost as painless as the account sign-up process. The most efficient way is to go straight to the login page, enter in your email address and password, and you will then gain access to your account page, which lists all of your current advertisements, using five different colors to indicate the status of each one — active, pending, "removed by me", expired, and flagged/deleted. In the upper right hand corner of the page, you will find a drop-down list of cities, which by default should be set to your current city. Just click the "go" button, which takes you to a page listing the eleven different types of postings. Probably the most commonly chosen one reads "for sale". If you choose that type, then you next must choose an ad category from a list of 38, ranging from antiques to video gaming. As shown in the screenshot below, I have chosen to list an item in the "household goods" category. For every ad that you post, you can provide a title, your location (since prospective buyers are generally expected to visit your residence to take a look at what you are selling), the price you're asking, a description of the item, and one or more images that you upload from your computer. For those who know how to format content using Hypertext Markup Language (HTML), then be aware that you can use HTML within your ad's description, with limitations on the tags available, for security reasons. You can hide your real email address on your posting, by choosing to anonymize your address, which is the default choice. Should people reply to your ad by using the anonymous address, Craigslist will forward their messages to your real address. Once you have finished listing all of your ads, you can sit back and wait to be contacted by eager buyers — thereby turning your junk into… their junk. Over the years, marketplace websites of all sizes have generally improved their user interfaces and designs, in an attempt to make their sites as attractive as possible, and to keep up with the latest advancements in Web design. 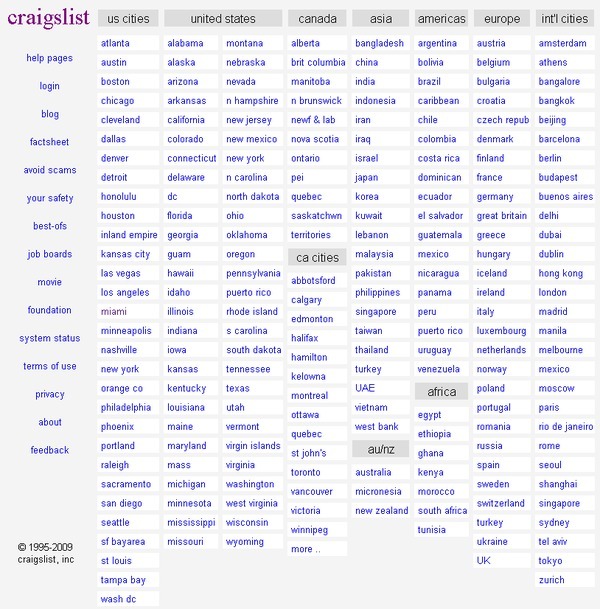 Ever the exception, Craigslist's appearance has remained largely unchanged — still looking much like it did at its inception. In fact, it's probably the only major website that still looks like something from the 1990s. Some users don't mind the primitive look, and design pundits have even argued that the non-slick look is an advantage, because it gives the site a reassuring appearance of frugal authenticity. Other users argue that the site is in desperate need of a visual overhaul, to at least bring it into the 21st century. 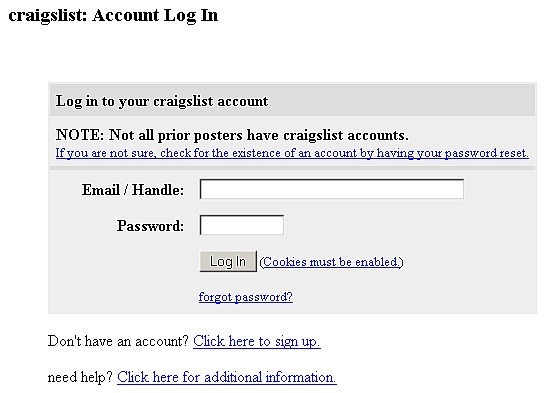 Yet an archaic user interface is the most innocuous of the common complaints leveled against Craigslist. As a result of its low (or no) barriers to access, it is far too easy for online miscreants, located anywhere in the world, to try to trap unwary sellers into shipping advertised goods, never to be paid. Watch out for these scammers, who will try to trick you into sending an item, either with no intention of paying, or with some sly technique of retracting the payment once your item is in their hands. To learn more about these possible swindles — which have victimized a nontrivial number of Craigslist users — simply use your favorite search engine to locate and read the details online. For the benefit of sellers, Craigslist does provide warnings of potential fraud, with real-life examples, on their scams page. Time is money, and you can certainly lose that as well. Craigslist is perhaps the most cost-effective way of selling items locally, provided that you don't count the time spent relisting the ads after they have expired, and responding to inquiries. Even worse, as a seller you will encounter people who have little regard for your time, but who apparently have plenty of their own, to ask you questions answered in your ad, and to dash your hopes by canceling or simply failing to show up as promised, with no apologies. At that point, you can send messages asking why they didn't appear, and more often than not you will not receive any reply. Countless times, after yet another prospective buyer does not show up as promised, I have probably muttered under my breath "Craigslist — the fastest way to find the flakes in your town." EBay and other auction sites have the advantage that when a bid has been placed on an item that you are selling, the odds are quite high that the sale will take place, and the winning bidder will not back out at the last minute. Not so with Craigslist, which at times can seem like a magnet for all source of characters — including no-shows, as well as penny pinchers who will try to get you to lower your already-bargain prices down to almost nothing. In some cases, people have lost far more than time and money, and they didn't even choose to be part of the Craigslist marketplace. For instance, a Seattle Times article outlines the horrible experience of a woman in Tacoma, Washington who had evicted a tenant from her rental property, and later learned that someone (and we can guess who) posted a fake Craigslist ad announcing that everything in the house could be hauled away, no questions asked. Unfortunately, countless people did exactly that — stripping her property, and costing untold damage. This sort of incident is of course more the exception than the rule, but buyers and sellers should nonetheless exercise caution and their best judgment when posting ads on Craigslist, or responding to the ads of others (or, for that matter, evicting deadbeat tenants from unsupervised rentals!). If you will be visiting someone's residence to look at an item that he or she is offering, or you have invited a prospective buyer to your home, consider bringing along a companion (or two) — the more the merrier, and the bigger the better. On balance, however, Craigslist can be a terrific resource for buyers and sellers — although auction sites and classified advertisers probably feel differently.